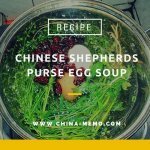 This page is my last post for China local food market, with more local food seen from our street market. Plus a look at our morning street market selling breakfast. 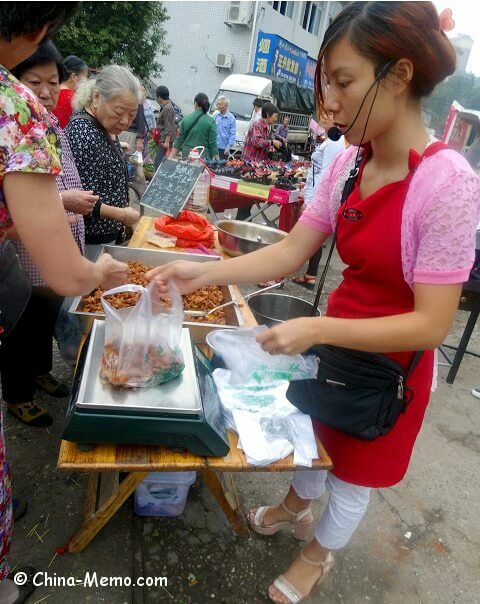 There are cooked meat product availabe from the street market too. 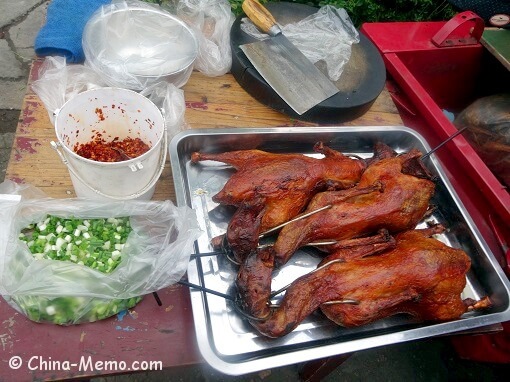 For example, here we have the roasted ducks, you can buy a quarter or a half. They can chop it for you. The seasonings will be provided in one plastic bag. 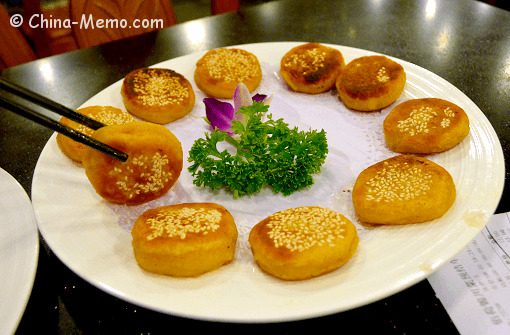 Because Hunan locals prefer the food having a strong flavour (taste), the seasoning is usually very hot and spicy. They won’t mix the seasoning with the meat, so you can decide how much you want to have. The lady selling the spicy chicken even wears a microphone, so people can hear her voice and no one would miss her food stand. 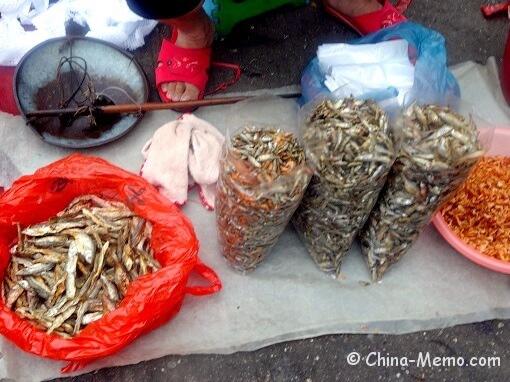 The local farmer’s self-made dried fishes, which is popular to fry with the red chilli and pickled radish. 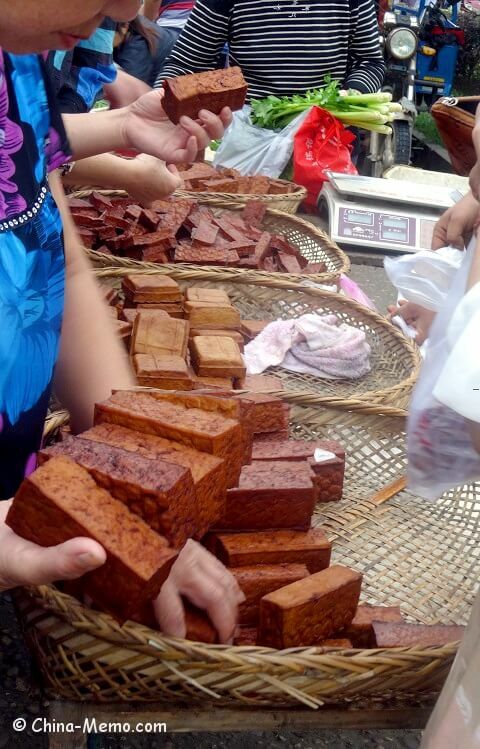 Here people are gathering to get xiang gan, one type of firm tofu. 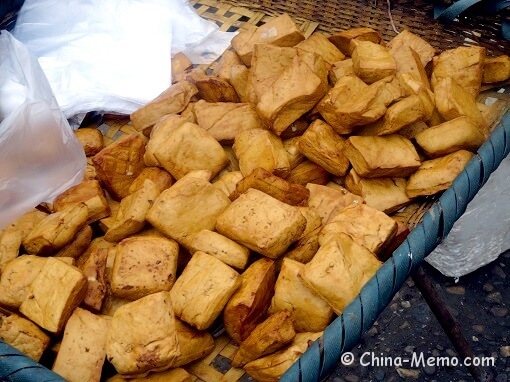 Thie is another type of tofu, not that dry, it is also called xiang gan. 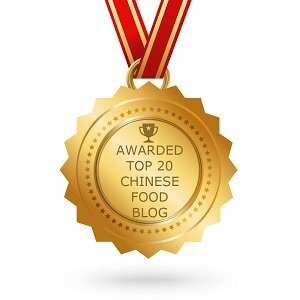 If interested, you may find out more about types of tofu in China. 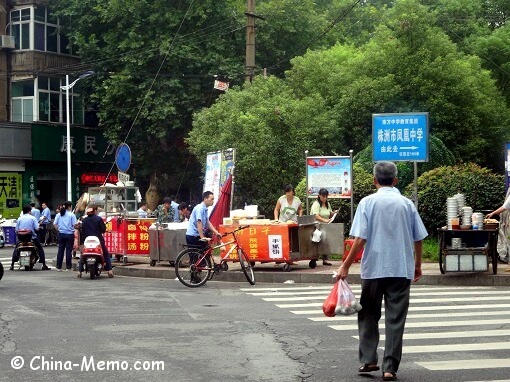 Once finish shopping vegetables and fruits, cross the road, there is a small morning market, where food vendors sell the breakfast to people on their way to work place. 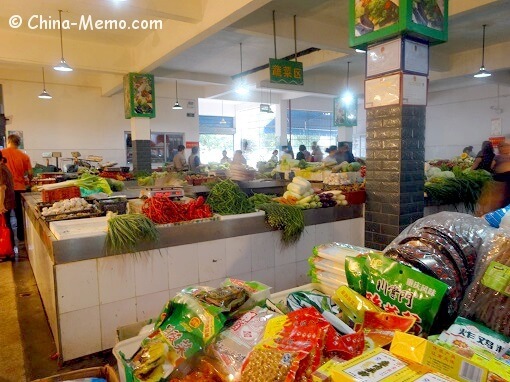 In our place, it is very normal that people get up in the morning, go to the local food market to buy breakfast. We may have breakfast in home, or have breakfast in the street food stall. 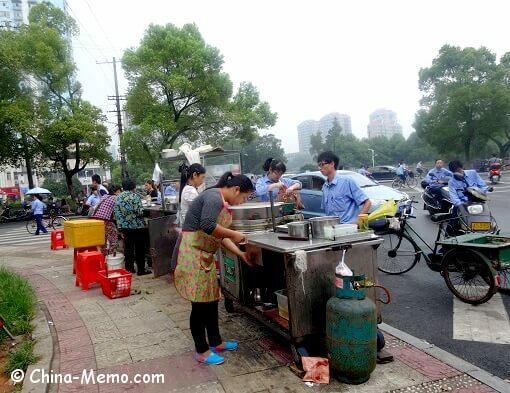 For people going to work, or high school students, they may just grab some breakfast from the street market, and bring the food to the work place to finish. This morning market is just made for this purpose. 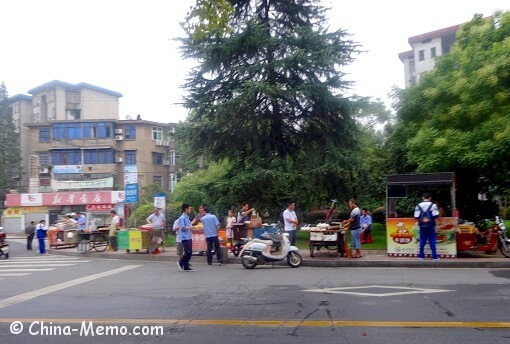 There are number of food stands set up along the road near the roundabout. The food stands all have wheels, so it will be easy to move away once the market is over. Let’s look what breakfast Chinese locals have. 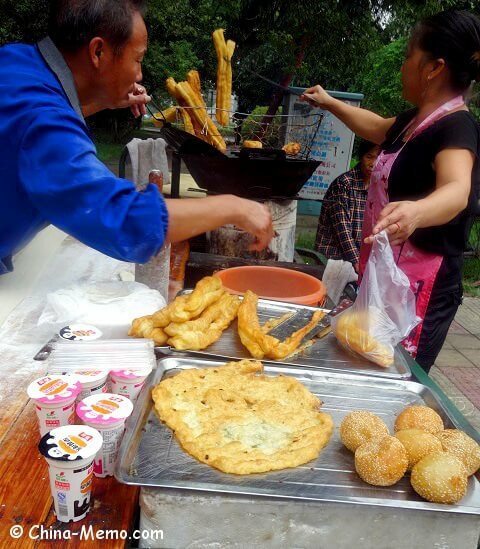 Here is the popular You Tiao, fried dough sticks, and fried sticky rice balls. 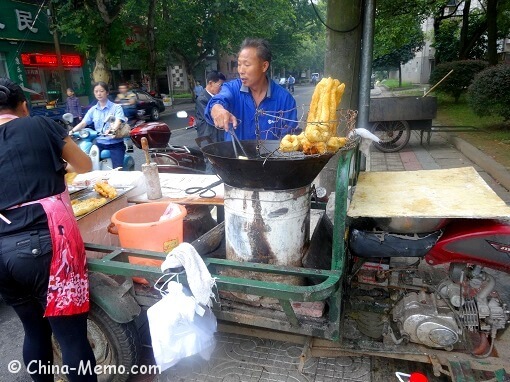 They use a motor tricycle to carry their stove and big wok. Plus a wood plate and a couple of trays, a easy and handy work platform is sorted. How clever it is! 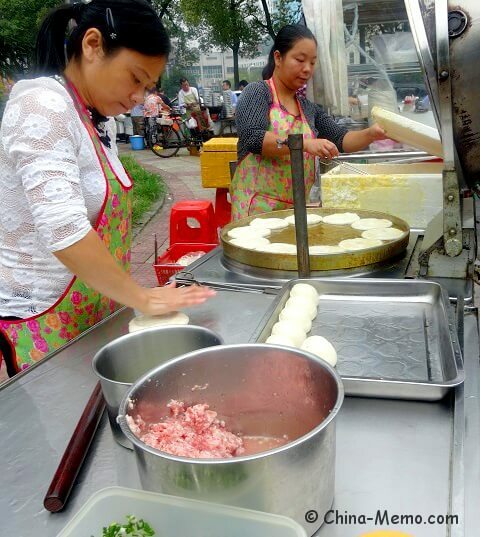 Here they are using electronic stove to make “Bing”, a food similar as meat stuffed pie. 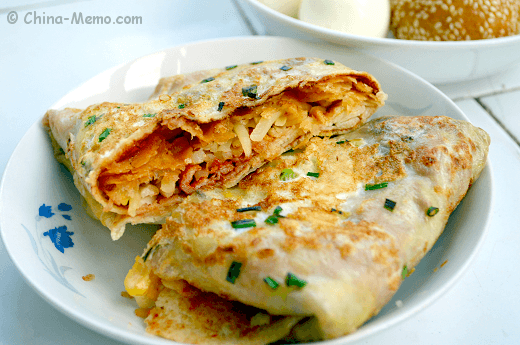 The Jian Bing Guo Zi is one of my favourites. 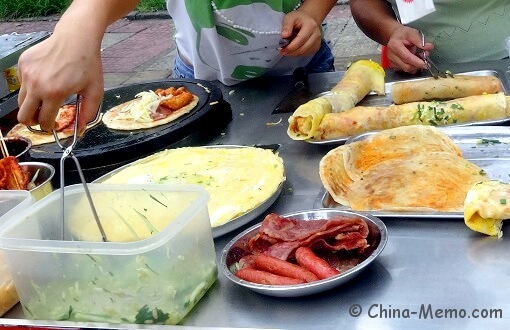 It is the egg pan cake with hotdog sausages, bacons and vegetables, seasoned by chilli bean paste. 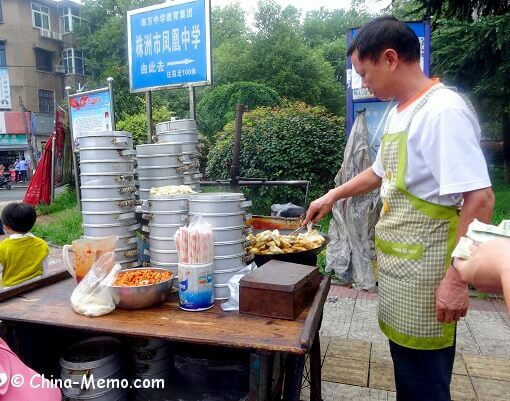 Of course, the steamed and fried dumplings are always there, I love them. If interested, you may see what breakfast we have bought here in Chinese Breakfast (4). 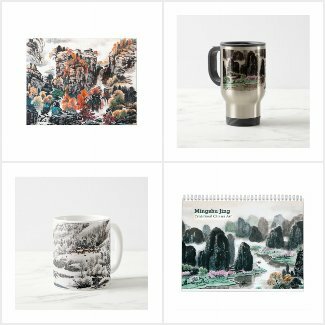 Hope you like the posts for China local food market, please share with your friends, Like it on Facebook or share on Twitter!